An installment loan is a fast and easy method of getting financing in Canada. Whether you are looking to pay for unexpected bills, fix up your car, make an investment into your business, or just go on vacation, online loans in Canada are quickly becoming a popular financing solution. It’s easy to get approved for an online loan in Canada. You don’t need to wait in long lines or fill out stacks of paperwork. After you complete a simple application online, you can usually get the cash you are looking for within just a few days, deposited directly into your bank account. At Smarter Loans, we’ve done the heavy lifting for you. Below you’ll find a list of reputable companies that offer online loans in Canada. Take a look and compare your options, including products offered, interest rates, terms, qualifications and even reviews from other customers. When you’ve found the loan you’re looking for, hit “Apply Now” next to the lender you want to try. You’ll be redirected to their website where you complete the online loan application. You can also pre-apply for a Canada installment loan right here on Smarter Loans, and we will find a suitable lender for your situation. They will reach out to you to process your loan request within 24-48 hours. Installment loans are a form of online loans that are provided to the borrower in a lump sum at the beginning of the transaction and then paid back over time at monthly or biweekly intervals. These loans are generally larger than payday loans, but smaller than the personal loans issued by financial institutions. The terms of an installment loan can range from short-term to medium-term durations, but most fall within the range of 6 months to under 5 years. However, these loans also come with a higher interest rate than personal loans as they are primarily targeted to borrowers with lower credit scores. What are the Uses of an Installment Loan? Installment loans can be issued to cover the costs of these repairs that are typically paid out in a lump sum either prior to or directly after completion of the repairs depending on the vendor. In cases where the borrower finds themselves unable to pay off an impending hydro, cellphone, or other type of basic utility bill, the installment loan can be used to keep the lights on – literally and figuratively. Unforeseen medical expenses that arrive unexpectedly often cannot be met by income and savings. If this is the case for a borrower, then the installment loan can be a lifeline that provides lump sum payment at the outset. What You Need for Installment Loans? This can be a tax slip, employer verification letter or other such document. However, a full-time job is not a criteria for the proof of income requirement. Part-time jobs, disability income, pension income, and social welfare benefits count too. In most cases, online installment loan providers ask for a valid and active bank account to deposit the funds into. However, it is also possible to obtain cash loans from a physical branch location in some cases, albeit rare. In most provinces and territories, the minimum age for receiving an installment loan is 18. For this reason, installment loan providers will ask for government-issued ID. Installment loans are typically extended only to Canadian citizens or permanent residents. While it is tempting to take out a large amount that covers the entirety of the expense, the high interest rate makes this an unfeasible idea. Borrowers should therefore look to budget conservatively, and obtain a loan only for the amount they cannot cover through savings and income. While some borrowers can wait for a few days, other situations call for an immediate need for cash. An important caveat though is that faster loans could also be more expensive. Evaluating the interest rate upfront is an important consideration as it determines the borrower’s cost of borrowing. Higher rates mean higher indebtedness when it comes to repayment time. Longer loan terms mean lower monthly payments, but higher interest charges in total by the end of the loan term, It is therefore important to evaluate which of the two to prioritize when selecting the loan term. Some installment loan providers may charge fees upfront such as administrative fees. Other fees can also encompass fees for late payments, all of which should be considered when making the final decision. Efficiency, efficiency, efficiency: Installment loans are much faster to obtain than other forms of personal loans, which typically involve meeting with a banking institution’s representatives before approval for the loan is received. Comparatively, the online nature of these loans means that approval can be finished within an hour and funds can be received as soon as the next business day. Acceptance of Poor Credit: These types of loans are available to all types of customers including those with poor credit scores as long as they demonstrate a reasonable ability to repay the principal and interest amounts. On the other hand, conventional personal loans come with strict lending criteria to target higher credit scores. Interest Rates: With the simplified processes required to obtain the loan, and relatively fewer requirements in terms of credit strength, lenders have to be compensated for the additional risk they take in lending to borrowers with an installment loan structure. This results in higher interest rates. Higher Repayments: Because installment loans can offer higher principal amounts than other payday loans, the cost of repayment from a purely principal perspective is higher as well, all other things equal. Fees: Some installment loan providers may charge additional administration, origination or other affiliated fees, which could add up to total costs for the borrower. Secured loans: While personal loans are typically extended to borrowers with stable credit scores, secured loans enable the borrower to offer collateral to the lender, thus making such loans less risky from the perspective of the lender. This translates to higher rates of approval and/or lower interest rates. Mortgage/Home Equity: With a clear fixed asset (the home) as collateral, this type of secured loan enables borrowers to borrow against the value of their homes. Credit unions: While credit union loans are largely offered on an unsecured basis, credit unions typically offer better rates than financial institutions. The rate can be pushed downwards further by securing the loan through a chequing account held with the union. Millennials tend to be the greatest users of “quick-cash” loans such as payday loans or installment loans. A survey conducted by PwC found that 42% of about 5500 millennial respondents surveyed had taken out one or both of these products at some point in their lives. The most common purpose that these loans were used for was to pay off student debt. 2 out of 3 respondents had at least one source of outstanding debt while 30% had more than one. Delving deeper into the college educated respondents, the number of people with atleast one source of long-term debt is 81%. 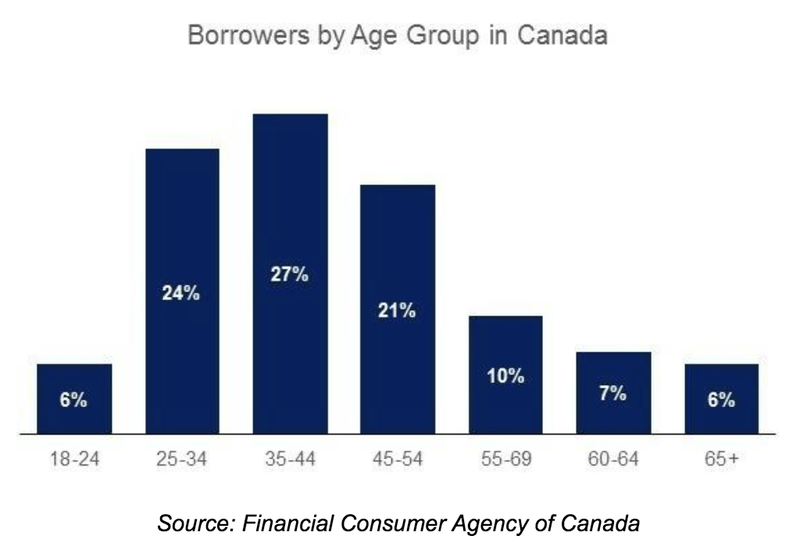 While data for installment loans is not publicly available due to lower regulations in the industry, the following graph shows the breakdown by age of payday loan users. This serves as a reasonable proxy for the installment loan, owing to the similarity in their loan profiles and target market.